Briefpapier mit gedr. Briefkopf. 2 SS. auf 1 Bl. 4to. [Adolf Hitler (1889–1945), Diktator]. – Briefpapier mit gedr. Briefkopf. 2 SS. auf 1 Bl. 4°. – Darauf der mit Berlin, 4. 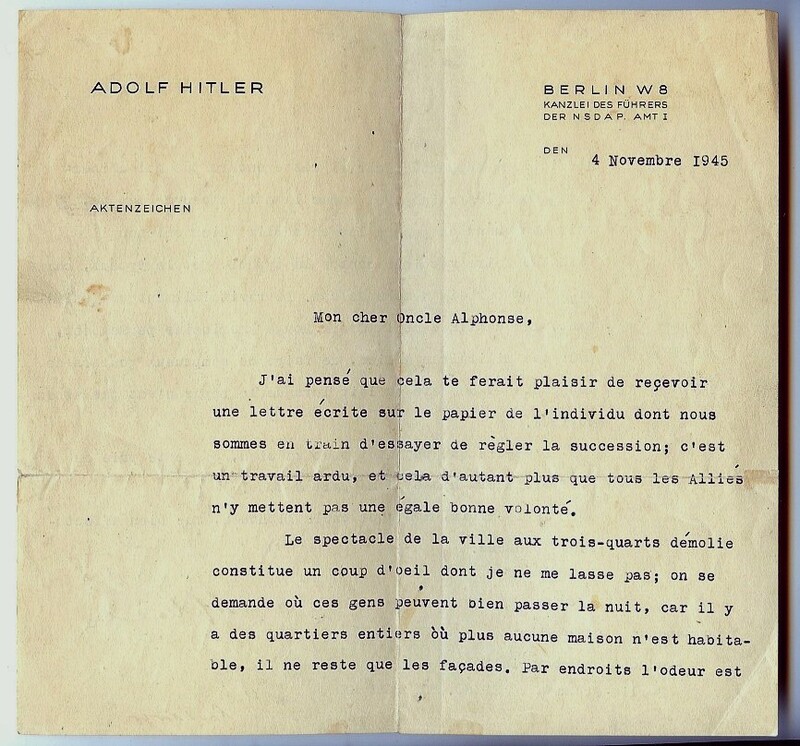 November 1945 datierende ms. Brief eines A. Schaller an seinen Onkel Alphonse: „J’ai pensé que cela te ferait plaisir de recervoir une lettre écrite sur le papier de l’individu dont nous sommes en train d’essayer de règler la succession; c’est un travail ardu, et cela d’autant plus que tous les Alliés n’y mettent pas une égale bonne volonté [...]“. – Etwas angestaubt und fleckig. Mein Kampf. Eine Abrechnung. [Vol. II: Die nationalsozialistische Bewegung]. Munich. 8vo. Original full vellum, spines ruled and direct lettered gilt, top edge gilt. In the original card slipcases. Frontispiece photographic portrait of Hitler to volume I, with his handwritten signature; each volume further inscribed, signed and dated by H.
First edition, copy number 94 of an "edition de luxe" (Prachtausgabe) of 500 copies, signed by the author, each volume further inscribed, signed and dated by Hitler, to the widow of Max Erwin von Scheubner-Richter, the only first-tier Nazi leader to die in the 1923 Beer Hall Putsch, and whom Hitler later claimed to be "irreplaceable" (P. Balakian, The Burning Tigris, p. 407). Part I carries a printed dedication to Scheubner-Richter and the other fifteen men who died in the Putsch, making this copy the de facto dedication copy. 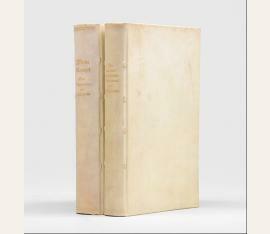 This edition, issued simultaneously with the first edition, apparently from the same setting of type, is printed on better quality paper, has the portrait frontispiece signed by hand, and is in a full vellum binding as opposed to the cloth and boards binding of the regular edition. - An early member of the Nazi Party, von Scheubner-Richter had, together with Alfred Rosenberg, devised the plan to drive the German government to revolution through the Beer Hall Putsch. In an exchange of fire during the Putsch, he was shot in the lungs and died instantly, bringing down Hitler, who had linked arms with him, in his fall. While Hitler dislocated his shoulder, the bullets aimed in his direction passed over his head: thus, Scheubner-Richter, through his own death, very likely saved Hitler's life. 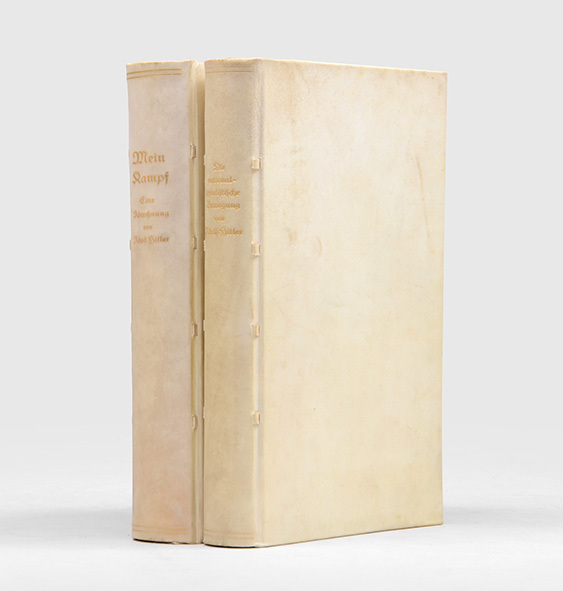 - Volume I of the set carries a handwritten dedication to Scheubner-Richter's widow Mathilde: "Frau Dr. von Scheubner Richter zu Neujahr 1926 herzlichst zugeeignet / Adolf Hitler / München, den 31. Dez[ember] 1925." Volume II reads "Frau Dr. von Scheubner-Richter zum Weihnachtsfest herzlichst zugeeignet / Adolf Hitler / München, den 27. Dez[ember] 1927". Laid in is a small handwritten card from Hitler, dated 30 December 1923 from Landsberg: "Liebe gnädige Frau! Am Ende dieses für Sie so traurigen Jahrs, will ich Ihnen verehrte gnädige Frau auf's herzlichste nur wünschen Sie möchten im Neuen Jahr den herben Schmerz vergessen können der Sie und Uns Alle traf. Ich denke oft an Sie und an Ih[n] liebe gnädige Frau und verbleibe in herzlicher Dienstbarkeit Ihr sehr ergebener Adolf Hitler" (At the end of this very sad year for you, I send heartfelt hope that you will be able to forget the deep pain that you and we have all met ... I think of you and him often ... and remain, your cordial servant and very devoted, Adolf Hitler). - Written in jail following the Putsch, the importance of "Mein Kampf" cannot be understated. Not only was it the origin and strength of the National Socialist programme transforming Hitler's status from a seedy local agitator to a potential national saviour in process, but more importantly caused a major turning point in the 20th century by setting the seeds for the most destructive war ever fought. Almost 40 when he started writing it, Hitler had achieved virtually nothing, but the book constituted a turning point in his career. "Political creeds as the basis for new religions have usually spelt danger for humanity. When they are distilled from the half-baked prejudices harboured by the more reactionary section of a nation not particularly noted for political enlightenment, they spell disaster" (PMM). In November 1923, Hitler was arrested after an unsuccessful Nazi putsch in Berlin. When he said, later, that this defeat was the greatest stroke of luck he ever had, he meant that without it he could not have made himself into a popular hero. The trial became a social event, with photographers waiting outside the courtroom. For high treason he could not have been given a lower sentence - five years of imprisonment, with the possibility of parole after the first six months. As a prisoner in the Landsberg Fortress, he was given preferential treatment. It was here that he dictated the first volume of Mein Kampf to his associate Rudolf Hess. Just before Christmas 1924, he was released after serving only nine months of his sentence. The first volume sets out his highly tendentious opinions about the world he grew up in, and about the 1914-18 war. It presents his justification for territorial acquisitiveness - Germany needs more Lebensraum - and airs his anti-Semitism. 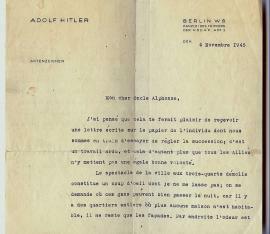 "Although it contained much that was shocking to many Germans, its main sentiments were widely shared in central Europe. A pseudo-mystic racial theory, totally unrelated to fact, was made to support pan-Germanism, anti-Semitism, militarism and ultra-nationalism, the combination of which was to be implemented by the unrestricted use of power as interpreted through the mentality of a superstitious bully" (PMM). Entitled "The National Socialist Movement", volume II (1927) contains most of the ideas later fleshed out in his policies. "This programme, with a detailed account of what it would entail nationally and internationally, is stated with complete frankness in the two volumes of 'Mein Kampf'. The brazenness of the declaration was due to naivety and immaturity. Unfortunately Europe was governed by small men at the time and when Hitler came to power in 1933 he found that his wildest claims and most extravagant actions earned but mild and ineffectual rebuke. His enemies accepted the occupation of the Rhineland, the tearing-up of the Versailles and Locarno Treaties, the abandonment of the League of Nations and the seizure of Austria and Czechoslovakia. Hitler had a right to be surprised at their violent reaction to the attack on Poland. It was all in Mein Kampf, but they just could not believe it" (PMM). - A notable copy with a remarkable provenance..